This Xbee Shield allows Arduino board to communicate wirelessly with each other using Zigbee. 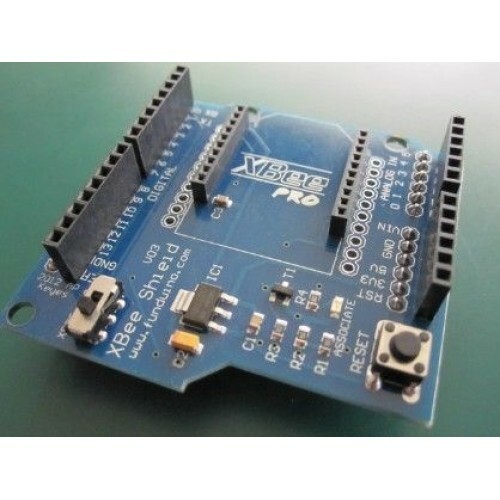 This Xbee/ZIgbee PRO Shield simplifies the task of interfacing a Xbee/Zigbee module to Arduino Uno. This module works with all Xbee module including Zigbee Series 1, Zigbee Series 2 and also Xbee Pro versions. Whats great it also works with Bluetooth bee Modules. The Xbee shield has two jumpers (the small removable plastic sleeves that each fit onto two of the three pins labelled Xbee/USB). These determine how the Xbee's serial communication connects to the serial communication between the microcontroller USB-to-serial chip on the Arduino board. With the jumpers in the Xbee position (i.e. on the two pins towards the interior of the board), the DOUT pin of the Xbee module is connected to the RX pin of the microcontroller; and DIN is connected to TX. Note that the RX and TX pins of the microcontroller are still connected to the TX and RX pins (respectively) of the FTDI chip - data sent from the microcontroller will be transmitted to the computer via USB as well as being sent wirelessly by the Xbee module. The microcontroller, however, will only be able to receive data from the Xbee module, not over USB from the computer. With the jumpers in the USB position (i.e. on the two pins nearest the edge of the board), the DOUT pin the Xbee module is connected to the RX pin of the FTDI chip, and DIN on the Xbee module is connected to the TX pin of the FTDI chip. This means that the Xbee module can communicate directly with the computer - however, this only works if the microcontroller has been removed from the Arduino board. If the microcontroller is left in the Arduino board, it will be able to talk to the computer normally via USB, but neither the computer nor the microcontroller will be able to talk to the Xbee module. ZIGBEE/XBEE 1MW WIRE ANTENNA SERIES 1 This is our most popular Zigbee wireless module. Zi..
Zigbee S2 Wireless ModuleZigbee s2 also called as Zigbee Series 2 or Xbee S2 modules are used to pro..
ZIGBEE XBee S2C ModuleXBee RF modules provide OEMs with a common footprint shared by multiple platfo..